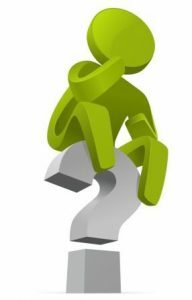 At Bounce Back ® horse fence we consider your questions are never to simple and believe it or not most have been asked before. Complete a contact us from clicking here. Call the office during business hours (02) 97566077. Star Picket Covers can be easily installed to new and existing fences. There is no need to remove posts from the ground. The cover should fit easily, and be slightly loose to allow for any bent pick posts. You can see from the picture to the left that there is some space inside the cover. Step 2 Drill hole through the top of the sleeve. 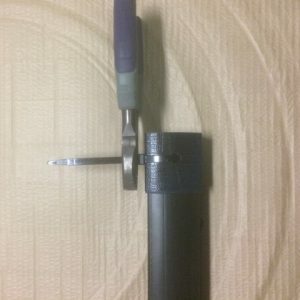 On the two long sides, drill a hole directly through the star picket sleeve. This hole should be at-least 10mm in diameter (this will match the diamter of the hole in most star pickets). The whole centre will be 25mm from the top edge of the sleeve, and approximately 18-20mm in from the point of the picket sleeve. But please check your picket post as the position of the top hole may vary between brands. 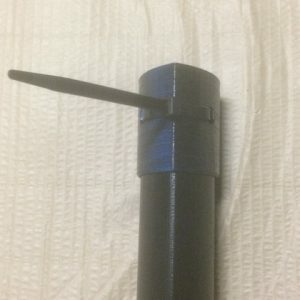 Step 3 – Place a picket sleeve cap on the end. 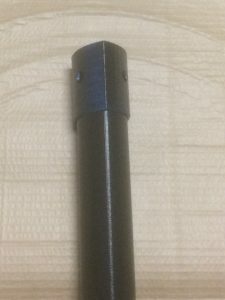 Our picket sleeve cap can then be slipped on the end of the cover. The picket sleeve cap will be a snug fit, but is not particularly tight. It will be secured to the cover in the following steps. 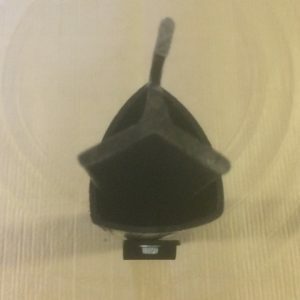 Step 4 – Insert a cable tie. Thread a cable tie through the holes in the cap, and through the drilled holes in the star picket sleeve. Tighten the cable tie as per normal. We recommend a 7.6mm black cable tie. This fits neatly into the hole. 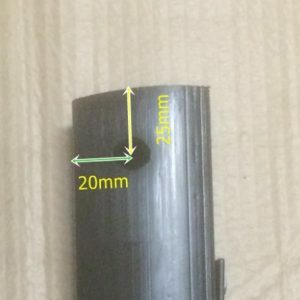 The length can be as short as is available, which is likely 200mm. Once the cable tie is tightened remove the excess plastic. Be careful to trim the plastic without leaving sharp edges. Step 6 Attach the desired wire clips or brackets as required. Various wire fencing and mesh clips can be attached to the covers using the correct screws. Don’t use screws with timber or steel cutters. A tight thread would be most beneficial. Our plastic coated wire fencing for horses is simple and easy to install. It’s suitable for the DIY horse lover, contract fencer and large equine business maintenance engineer. Our PCW bracket for the interim posts (optional). 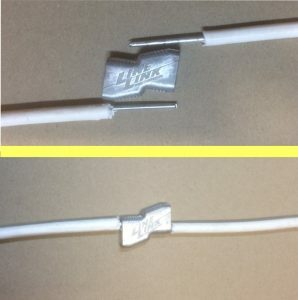 We will need to remove a section of polymer coating at each end of the wire. 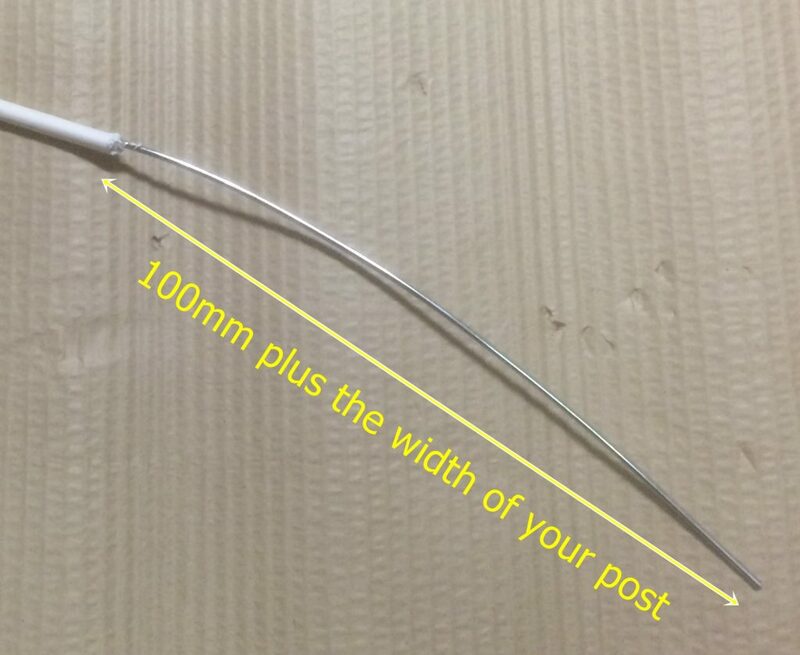 Please allow for the width of your post plus 100mm spare wire (e.g. if using 200mm round post please allow 300mm of exposed wire). This cut should be made at a point in the wire that will be in line with the inside of your straining post. Make a small cut in the polymer coating using pliers, utility knife or wire cutters. Be careful not to cut into the galvanized wire but ensure a clean break in the polymer. Step 2 twist the polymer coating to break the bond with the wire. By twisting the polymer coating back and forth with a set of multi-grips or general purpose pliers you can break the bond with the steel and allow the coating to be easily removed. Grab the polymer section you want to remove with the multi grips and rotate it around the wire until it moves freely. 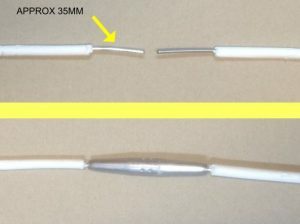 Using our wire stripper pliers as shown on the left, or using a set of multi grip pliers, strip the polymer from the wire. Please refer to the right hand side of the picture. 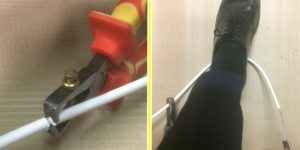 To make it easy to remove, it can be handy to grip the other end of the plastic coated wire with multi-grips and bend around the base of a fence post or the heel of your shoe. This secure the wire and makes it easier to remove the unwanted section of plastic coating. Leaving you with some exposed wire that looks like this. Drill a hole approximately 10mm diameter through the straining post. 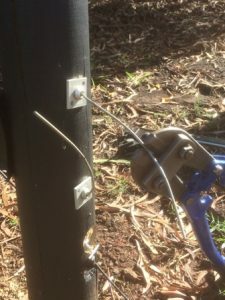 Then insert the now exposed wire though the hole from inside to outside so that approximately 100mm of exposed wire is seen from the outside of the post. Insert a wire end vise onto the wire and push up to the post. With one end of the plastic coated wire fencing attached we now need to attach it to the interim posts. 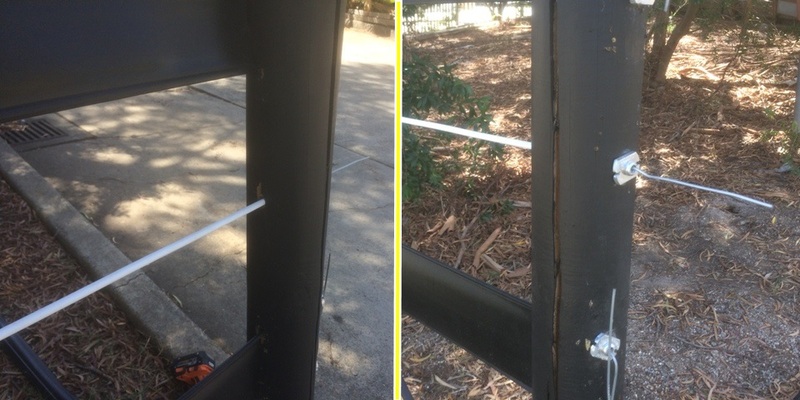 The simplest and quickest method of attaching the plastic coated wire fencing to the interim posts is to use on of our PCW brackets. Fitted similarly to the rail for our 120mm product, it is easily attached with two hex head screws. It is often easiest to fit each bracket with one screw, loosely, than insert the wire from above along the run. 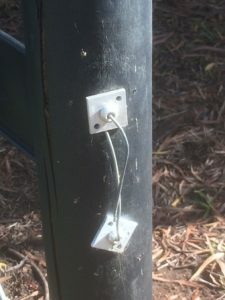 The bracket with one screw will usually have enough friction to keep the wire in place, so you can easily go back along the run and fix the top screw. These brackets are designed to allow for lateral movement, providing some flex should impact occur. Another option for the interim posts is to drill a hole through the posts and run the plastic coated wire fencing through that hole. Our plastic coated wire is 7mm nominal diameter so an 8mm – 10mm hole would suffice. 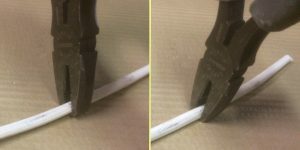 Once the PWC has been attached to the interim posts, attache the end of the wire to the second straining post (similar to Step 3 and 4 for the first end post). Make sure to remove enough polymer coating so that the wire is covered along the run. 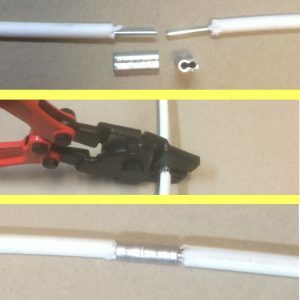 Ideally the wire should be coated 5mm into the end post completely hiding an exposed wire and allowing enough room to strain the wire. Then place the straining tool on the vise and pull the wire using the lever action. It may be necessary, but often is not, to also strain the wire from the other end. Once you are happy with the tightness of the wire consider using our wire end vise covers to cover up the left over piece of wire and end vise. sections before installing the joined wire. Other joiners and swages can be used similarly. The amount of polymer coating to be removed with device varies but photos of common joiner types giving basic instruction are below. Join using proprietary wire joiner. Click here to download a PDF copy of the plastic coated wire fencing installation manual. 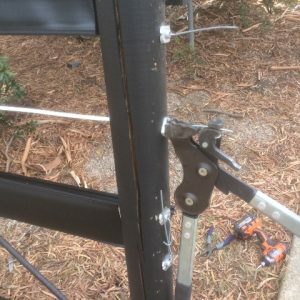 How to install our cover for the wire end vise? This step by step guide will show you how to easily install the wire end vise cover. 5 – Drill in four stainless screws for each pair of vises to attach the wire end vice cover to the post. Screws should be between 10mm and 20mm long. Note: Galvanized screws of this length are not often recommended as the thread tends to be to narrow for the coating to be effective. Note that on gate posts it is often required to install the cover over each pair of vises separately. 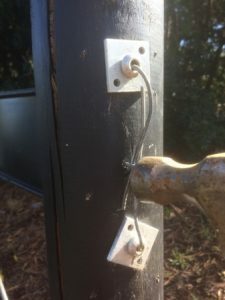 This is needed to allow for gate hardware to be attached to the post. In that instance cut the the covers into 150mm lengths with a knife, pair of snips or hacksaw. Generally though the cover will be used in one piece on the straining post to cover all of the vises on that post. For information on the range of covers available and their use see article on wire end vise covers for sale. If you have any more questions on how to cover wire end vise please contact us. How wide is the horse fence rail? Our rail is 120mm wide. This is significantly broader than the cheap and highly marketed imported products which are typically 4.5inch or approximately 100mm wide. The extra width provides firstly for greater visibility for the horses and provides the owner with a more substantial look. The 120mm width has the added advantage of providing a traditional timber post and rail look. For more information of the products dimensions see Horse Fence Rail Specifications. 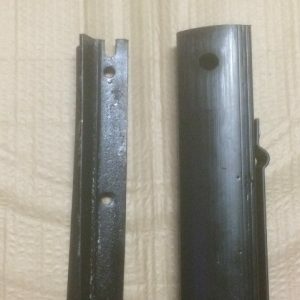 Does the rail go brittle over time? Our polymer is polyethylene and it is UV stabilised and has heat absorbers added. The integrity of the polymer will NOT degrade over time. This question is often a reflection of the PVC version made in the 1980’s and 1990’s by another supplier. Unfortunately from a distance it looked similar to our product and has from time to time been confused with ours. Flexible PVC is inherently difficult to UV stabilize and we would not contemplate making our rail from this material. 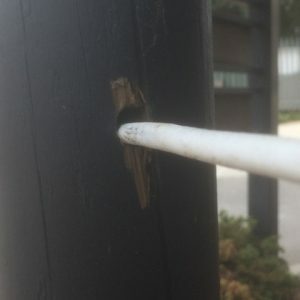 There have been a number of failures reported on flexible PVC fencing whereby it did become brittle, crack and split (in particular after impact with horses) and the wire became exposed. Alas this supplier has done no favours to the market for flexible horse fencing in particular in NSW. The product will only stretch as much as the 2.5mm high tensile wire that reinforces the polymer. It will obviously stretch slightly when first strained like a wire fence. However unlike cheap imported versions the product like retain its length and not become loose overtime. Customers should expect to have to periodically re tension the rail to keep its original taught appearance. Perhaps annually and perhaps never. This results not from the product stretching but rather post movement from soil compaction or expansion and from horses impacting the fence. As soil conditions and use vary we can not predict this requirement. Some customers proudly state that their rail has not be tensioned after 5 years and it is still looking like new, but the result will vary. For further information see our horse rail specifications. Can horses break through the fence? Certainly not, our product is reinforced by 2*2.5mm high tensile wires. Our product is designed to withstand impact and at the same time have enough flexibility to cushion the impact for the horse. This is not a cheap temporary solution. This is a permanent quality product. Be aware of cheap imported tapes and ropes which can fail upon impact. See our Horse Fence Rail Specifications for more information. Can you recommend a paint for horse fence posts? Customers are often excited about our horse fence products because they never need painting. But what to do about the posts? We can recommend Derivan’s anti crib for its easy application and long lasting finish, see Derivan Anticrib for more details. Is your horse fencing system suitable for DIY? Yes mums and dads have been installing the product for over 30 years. So you can to. There is an easy to follow installation manual and installation videos on our installation page Horse Fence Installation Manuals and Videos. Do horses chew Bounce Back ® horse fence rail? No our rail is unpalatable. The rail is also non-porous which prevents wind sucking and cribbing issues experienced with timber. It is normal for horses to curiously chew, lick and mouth at the rail when first installed. But they soon lose interest. The rail because it is smooth and flexible is also hard for them to sink their teeth into so it is not left with scratches or teeth marks. Why don’t you sell the spoolers or coilers featured in other horse fence systems? 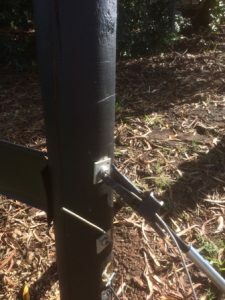 We believe our straining system is the simplest in any horse fence system available in Australia. Our wire end vices are also low profile and have no sharp edges. Customer feedback on cooling systems that are attached to the end post suggest these are very hard work to strain. A lot of pressure needs to be applied to turn the coiled fence. The inline “spooler” featured in a prominent imported horse fence system is large, expensive and leaves an unnatractive device midway on the rail of the fence. Customers suggest these are difficult to line up with the spoolers on the lower rail leaving an untidy finish. 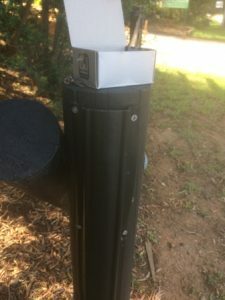 Other customers suggest the spooler creates another safety issue given that it is along the fence run and away from the post. To see how easy it is to use our devices see Vimeo – Straining Bounce Back Horse Fence. Does the black horse fencing rail fade over time? This is a common question from customers concerned that the rail will go grey or fade over time. Be aware of cheaper alternatives and imports not made for Australian conditions. Customer feedback and our own weathering testing indicate their is minimal fade in the black rail. It is more likely that the black rail will look lighter over time doe to the accumulation of light dust then a fading of the polymer itself. Such dust can be easily be removed by water from a pressure sprayer, as the material is non porous. We anticipate that our brown rail will have even less inclination to fade. For further information read our Horse Fence Rail Specifications. How long will the horse fence product last? The product is backed by a ten year full replacement warranty direct from us as the manufacturer. We anticipate an even longer life. Customers from the 1980’s report they still have their installations in place without any significant “ageing of the product”. We have even had customers who installed the product over 30 years ago who have cut their fence down, rolled it up and take to the next property. The product will outlast timber rails, tape and rope fences. NO ! Due to the technical difficulties UV stabilizing PVC we would never attempt to make our horse fence rail out of that Polymer. PVC has been used by other companies with fencing and there have been significant issues with the material becoming brittle. These brittle fences can be broken by horses, that can crack exposing the wire and cause a serious injury risk. All horse owners should specifically ask what polymer is being used if they consider alternative suppliers. The polymer used is Polyethylene and it is UV stabilized and has heat absorbers added. For more information see What is our horse fence rail made of? What sort of warranty is provided ? Our product comes with a full manufacturers replacement warranty. This warranty is valid for ten years from date of purchase. Customers have piece of mind that they have purchased direct from the manufacturer and liability under the warranty rests solely with an Australian company. Be aware of warranties provided by other suppliers and if that warranty rests with the local agent or an overseas manufacturer. Any installations that are not standard. Any installations that have not been performed in accordance with the instructions listed on this website and linked videos. Any form of damage to the fence done whether by negligence or other reason by any person. Any other matter as prescribed in Acacia Products terms of sale. 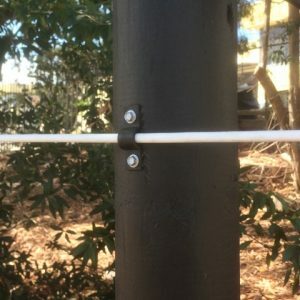 Do you sell posts for horse fencing? Yes we currently manufacture and sell horse fencing posts, see Horse Fence Posts. These posts are designed to compliment our rail. However these posts are not required for our system and a number of different fence posts can be used. Customers often acquire their posts locally, due to transport costs, and typically that’s at the local timber merchant. For general requirements on posts see the FAQ: What sort of Fence Posts are required? ?